Whether you need cotton yarn for crocheting dishcloths or faux fur for knitting fashionable scarves, there’s a variety of yarn types available to match your needs. Synthetic yarns, such as acrylic are usually slightly elastic which make them ideal for beginners. Many synthetics are also available as basic worsted-weight yarns, which are suitable for most types of knitting or crochet projects. More expensive wool and cotton blends tend to be a little trickier to use, while specialty yarns like boucle yarn have their own unique challenges. Still, the extra flair makes these specialty yarns highly popular. Whether you’re looking the best yarn for a project, or just looking for something new to try, the different types of yarn here offer you some great options. Okay, I’m gonna start this review of best yarns from the craft stores with some cotton and cotton blend yarns. And the first one I’m gonna talk about is one that I know a lot of you will be familiar with and that is the Peaches & Creme. 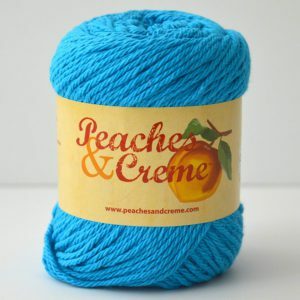 This is kind of the definition of best yarn to use for knitting and crochet projects, because it is so durable. It is worsted weight, 100% cotton, and it’s made in Canada. You can get this from Walmart and the price is around $2.50. In one of these little skeins, you get 120 yards in 71 grams. But it also comes in larger size cones which are 400 grams with 700 yards of yarn for around $8. This yarn holds up like nothing else. You can throw it in the washing machine, and dryer, no problem. I loved that it’s so indestructible and easy care. It comes in over 60 different colorways, some are solid colors, some are stripes, and some are variegated. The colorway that I have here is called Bright Blue and you can find pretty much any color you want either in person at your store or by ordering it online. There are also yarns that are basically the same as this at JOANN’s and Michaels. The brand that they have is called Sugar ‘n Cream, but it’s essentially the same thing. The recommended needle size is a U.S. seven or 4.5 millimeter. Now you know I always like to look at the star ratings and reviews people have given different yarns online, and, it’s weird, but I was only really able to find a handful of ratings on this Peaches & Creme yarn. But all the ones I found were very positive, and averaged about 4.7 stars out of five stars. Positive reviews talk about its durability, its softness, easy laundering, great color options, low price, and nice stitch definition. There were a few drawbacks mentioned, even from people who gave it a good rating. And those were things like, the colors faded after washing, lack of elasticity made it hard to work with, which is gonna be true for any cotton yarn, and some people thought the yarn felt stiff. But it’s still a very popular yarn. If you look on Ravelry, you’ll see that there are over 41,000 projects made with Peaches & Creme yarn. And by far the number one project in this yarn is dishcloths, that’s what I’ve always used it to make, and, it makes awesome dishcloths. I always tell people I have not bought a dishcloth in a store for over 20 years. Dishcloths made with this yarn will last years, and years, and years, and I have some right here that I’ve recently made so you can see some examples of the different colors. And my favorite go-to pattern for dishcloths and apparently this is true for everyone else on Ravelry as well, is called Grandmother’s Favorite Dishcloth. It’s the one knit corner to corner, and its got this pretty little border on it. This is a super easy, mindless pattern that you can whip out in probably 15 to 30 minutes. Knitting up a set of these dishcloths makes great housewarming gifts or hostess gifts. Now if you’re interested in what else people are making with Peaches & Creme yarn, it’s a lot of household items. I found beautiful crocheted hot pads. And here’s another crochet project, it’s a bowl cozy which are really popular right now. I’ve always loved these Swiffer covers like this one. So you put this over the bottom of your Swiffer, and you can dust your floors without throwing out all those disposable ones in the trash. With this you can just put it in the washer and dryer, and it’s ready for next time. And how about gorgeous blanket? And then there’s bag you could use as a market bag or a beach tote. There are also a lot of baby and children’s items like this adorable stuffed elephant, and baby hat. This cute little striped dress. And these sweet baby shoes. So yeah, these are some ideas for projects that you can make with this Peaches & Creme yarn. Now this next yarn I’m gonna talk about isn’t cotton but it kinda goes along with the Peaches & Creme yarn I just talked about so I thought I would include it here, this is Red Heart Scrubby which is 100% polyester. It’s an eyelash yarn with a chain construction which means that the main strand of yarn is not plies that are spun together like most other yarns are made, but instead it’s essentially knit into tiny loops. The eyelash characteristic means that it has these long strands of fiber that stick out from the main body of the yarn that look kind of like eyelashes. When it’s knit up, the fabric looks very texturized with the little eyelash fibers sticking out all over it. Red Heart Scrubby comes in little skeins of this size which are 100 grams and 92 yards. Again it is 100% polyester, and you can find it at JOANN’s for about $4.50, regular price. I saw that it’s currently on sale for $3, although I’m not sure how long that sale will be going on. It is available in 27 colors, and this particular one is called Ocean. Some are solid colors and some are variegated. There are a couple of other varieties of Scrubby which are Scrubby Sparkle. It’s another one made out of polyester but it has little glittery pieces in it. And Scrubby Cotton, which still has this texturized appearance, but it’s made out of cotton, so it’s gonna be absorbent and a little softer. Now the recommended needle size for this, is a U.S. eight or five millimeter. This is another easy care yarn. You can throw it into the washing machine and tumble dry. The online reviews for Scrubby are pretty good, on the JOANN’s website, there were almost 200 reviews that I found, and the average was 4.6 stars. 80% of the reviewers had given it a five star rating. And, what are the reviewers saying? Well, they’re saying that it’s easy to work with, there’s an awesome selection of colors, it’s economical, easy care, and the items made with it are long-lasting. There were only a few low ratings, but those people said that the yarn was too soft to really scrub anything, the stitches are hard to see on the needles, and the yarn is slick, so the stitches slide right off the needles. And I will agree that the eyelash texture does obscure the stitches a bit on the needle, and you’ll probably wanna use a wood or bamboo needle when working with this yarn so that the stitches are less likely to slip off the needles. But still, people are really liking this one too. Now Red Heart Scrubby is marketed as dish cloth yarn because it’s got this texture when knit up, it’s good for cleaning dishes. There are over 1,600 projects made out of this yarn on Ravelry, and the vast majority of them are some kind of dishcloth. There are some simple ones that are knit, and others that are crocheted. There are even some that mix the Peaches & Creme yarn with the Scrubby yarn like this dishcloth with a Scrubby corner. 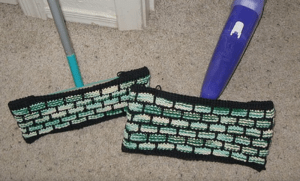 This also makes nice washcloths like this one that’s just a basic knit square. And then you could easily make a soap sack out of it, which is what I did. Here I just cast on 20 stitches on a U.S. size eight or five millimeter needle and then knit about 10 inches. This created a rectangle that was about five by 10 inches and I just made an envelope out of it by folding up the rectangle about 1/3 of the way up and whip stitching the sides. And that leaves the flap with a pocket, you just simply insert a bar of soap into the pocket and then, fold the flap down inside. So that gives you this nice, exfoliating washcloth. It’s super easy, there’s no buttons or anything to worry about. The only drawback, that I’ll say, is that I didn’t find the yarn too enjoyable to work with. It can be a little rough feeling on your hands, and with all the eyelash fibers sticking out, like I said, it can be hard to see what you’re doing when you’re knitting with it. Maybe it would be easier for crochet, I’m not sure. But besides washcloths and dishcloths, I’ve found a few other projects made out of this yarn that I thought were worth showing. So, someone made this cute, Hawaiian grass skirt for their daughter’s doll. And then I found this knit cactus that I thought was really fun. And look at this this adorable llama hat! Where the llama hair is made out of this Scrubby yarn. 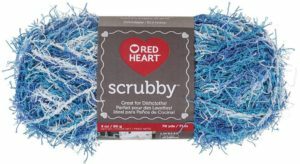 Red Heart Scrubby is good to use for utility items, like washcloths and dishcloths, but it can be used for other craft items as well. Okay, so back to the cotton yarns, this next one is called Cotton Fair, and it’s by Premier Yarns. It’s a sport weight yarn that is a cotton acrylic blend. It’s 52% cotton and 48% acrylic. And you get 317 yards in a 100 gram ball. It is machine washable, but not tumble dry, I would lay it flat to dry. The recommended needle size is a U.S. four, or a 3.5 millimeter. It comes in 28 different colorways, some are solid, and some are variegated. The colors I have here are called Bright Peach, and this one is called Turquoise. This yarn runs about $5 at JOANN’s and Michaels, but of course you can always shop sales and use coupons to decrease the cost. 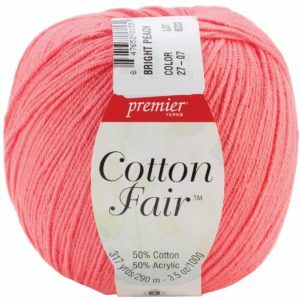 Now I saw around 200 ratings of Cotton Fair yarn on different websites. And the average was about a 4.8 stars. 80% of the ratings were five stars, and those raters said the yarn was great to work with, it didn’t split like a lot of cotton yarns do, it had generous yardage, and held up well in the wash. The biggest complaints were that the craft stores only carry a limited selection of colors, so even people who gave it five stars complained about the lack of inventory. But honestly, if you want the choice of all the different colors, order it directly from the Premier Yarns website, where they have all the colors available, and it’s still only $5 a ball. And the only other complaint that people, that I saw that people had, was that people didn’t realize it was not 100% cotton. So if you need 100% cotton yarn, then don’t get this one, because it is a blend. I personally think this is a beautiful yarn. It’s very soft. Much softer than most 100% cotton yarns. It has a nice, tight twist, which will improve the stitch definition, and it will be less likely to split when you’re working with it. I love the blend of acrylic and cotton. You get the lightweight feel of cotton, and the absorbency, but the acrylic adds body to the yarn. As I’ve said many times in my posts, by itself, cotton has no elasticity whatsoever. 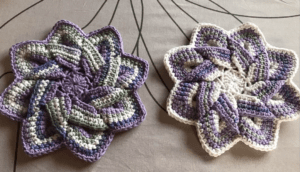 That makes it difficult to work with, because when you’re crocheting or knitting, sometimes you really struggle with those stitches, especially if you have a tight gauge. And I know a lot of people with hand issues, like arthritis, or carpel tunnel problems can have a really difficult time working with pure cotton. The acrylic in this yarn adds elasticity, and that makes it way easier to produce stitches and just faster to progress with your projects. The acrylic will also add strength to the yarn. The drawback is that acrylic is very prone to pilling. You know, those unsightly little balls of fiber that collect on the surface of fabric, which is basically caused by the friction of wearing something or washing it. Cotton is not prone to pilling, but acrylic is. So with this blend you might find a little more pilling than you wood with pure cotton. I personally like a cotton acrylic blends for making things like lightweight summer garments and baby things. Let’s take a look at Ravelry and see what people are making with this yarn. I do see a lot of baby items like this beautiful sweater, and look at this gorgeous christening dress. There are also some stuffed animals like this cute little elephant. And snuggly bear. And some baby blankets like this one. There are also some beautiful shawls like this colorful one. And lacy one. There are some adult pullover sweaters like this nice one, and this really pretty lace skirt. And then some hats. Now what I’ve used Cotton Fair yarn for is chemo hats. Now this is not gonna be for keeping someone’s head warm in the winter, but it is nice for summer. And the pattern that use a lot for chemo hats, is the Lace-Edged Women’s Hat by Julie Hentz. It’s a free pattern on Ravelry, and it calls for a DK weight yarn. This is a little bit lighter weight, it’s a sport weight, but it works okay. This is one that I made out of the Turquoise yarn, it’s very lightweight and soft, and I really like the lacy pattern around the edge, not only for decoration, but because it’s not tight against the head like ribbing would be, so that makes it a little more comfortable for the chemo patients. Okay, so that is Premier Yarn’s Cotton Fair. While yarn is a very simple material made of fibers spun to create a long strand, describing it isn’t always so simple. 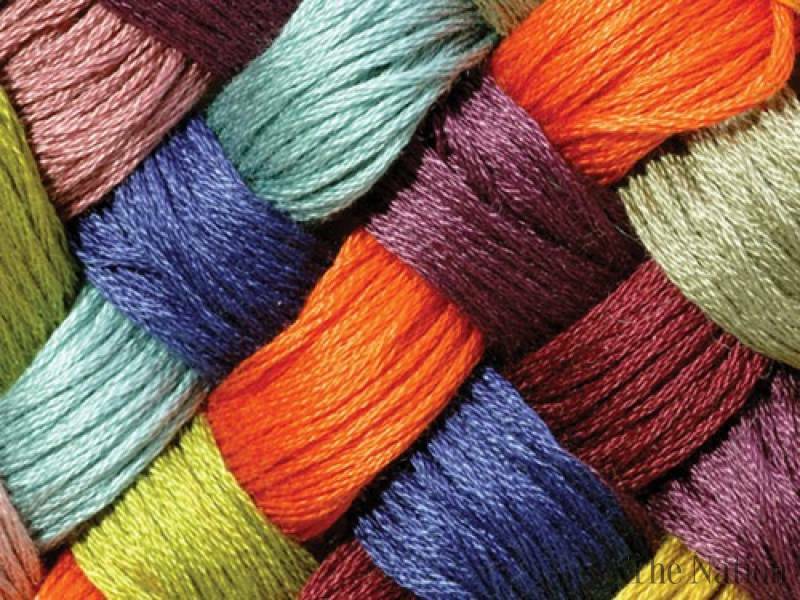 Besides color, people tend to use certain terms to describe yarn’s weight, its texture, and even its source. This guide should help you understand the basic terms you will find on a package of yarn or listed within a set of instructions. Many crafters prefer to work with natural fibers both for their texture and that they’re also a renewable resource. How the product will be used is another important consideration since cotton can be highly absorbent making it a good choice for washcloths or towels; keep in mind it’s also highly flammable and can be an allergen for some people. Synthetic materials are generally less flammable but may melt if exposed to high temperatures. Ultimately, the best material will be one you’re most comfortable working with while meeting any requirements you have for your specific project. For most projects, you want to avoid yarn that pills or turns fuzzy after you wash it. Felting yarn is different since felting intentionally mats the yarn fibers to create a solid block of material. Crafters have used a wide variety of yarns for felting, including synthetics, but loosely spun yarns made from animal fibers are generally the easiest to felt. This is a rather broad term encompassing any unusual type of yarn, particularly when the fibers are spun to create a pattern or texture in the yarn. Boucle yarn and eyelash yarn are a couple of the most common types of specialty yarn, with tight loops or curls added to the former and long, loose strands threaded through the latter. 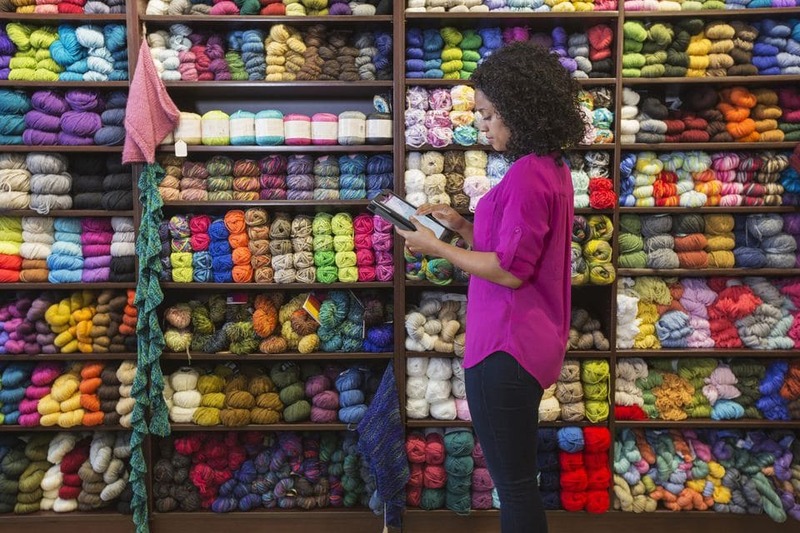 And now it’s your turn to go down to the comments section and share your favorite yarns! Are you familiar with any of the yarns that I talked about today, and have you used them? And what projects did you make? And if you haven’t used them, which ones are you intrigued and likely to try? I’m always eager to hear your experiences, I love hearing from you, and I love it when you share your experiences that help us all out.